Notre Dame honored one of its most decorated senior classes in style, cruising to a 5-0 Senior Day victory over Pittsburgh on Saturday. The No. 14 Irish (9-3-5, 4-2-2 ACC) dominated the shot count for the game but only pulled away from the Panthers (5-9-3, 0-7-1) early in the second half to record their largest victory and highest goal count of the season. Irish head coach Bobby Clark praised his seven seniors, who won regular-season conference titles in both the Big East and the ACC, as well as a national championship in 2013, but said he hoped the class can still add to their haul of hardware. “It’s been a great senior class,” Clark said. “The team did well today, but hopefully there’s more to come for these guys. This is the end of the regular season, but this is the most important part of the season. Obviously to get into the tournament is important, but this is the cutting edge of the season, so hopefully we’ve got a lot of unfinished business to still take care of. 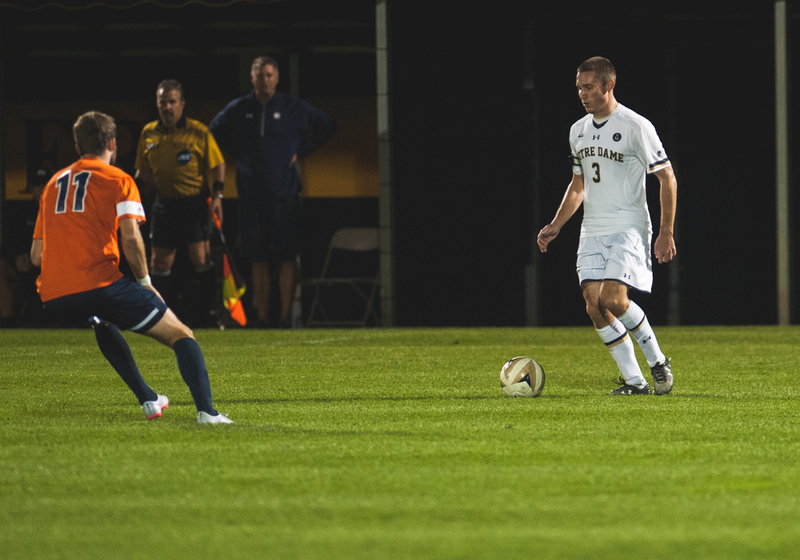 Senior midfielder Connor Klekota looks to pass during Notre Dame’s 3-1 victory over Virginia on Sept. 25 at Alumni Stadium. The Irish thought they had the first goal of the game in the 14th minute. A piece of skill from sophomore forward Jon Gallagher let him past a defender and into the box, where he played a square ball toward junior midfielder Oliver Harris. Pittsburgh senior goalkeeper Dan Lynd got a touch to the ball, but Harris still had no problem knocking it into the empty net. However, after much deliberation among the officials, the goal was waved off due to an offside that occurred almost a minute earlier. It didn’t take long for the Irish to make up that lost goal though, as four minutes later, a pass from senior midfielder Evan Panken set Gallagher free with only Lynd to beat. Lynd left his penalty area to challenge the forward, but Gallagher rounded him with ease and tapped the ball into the open goal. The Irish had chances to widen their lead in the first half, including a cross from senior defender Michael Shipp to Harris, but with most of the goal to aim at, the midfielder shot wide. As the second half began, heavy rain began to fall and the Irish opened up the floodgates with three goals in a two-minute run starting in the 55th minute. The flurry began with a cross from graduate student defender Max Lachowecki on the left wing, which went over most of the bodies in a crowded box to find Panken on the run and unmarked. Panken headed the ball straight down into the bottom left-hand corner of the net to make the score 2-0. Just a minute later, senior midfielder Patrick Hodan sent a corner to junior defender Brandon Aubrey on the back post. Aubrey had time to take a touch and shoot, and despite a heavy deflection off a Panthers defender, the ball went in. The Irish extended their lead again fewer than 30 seconds after kickoff. A pass from Shipp gave junior midfielder/forward Mark Gormley the ball in the box, and he tapped the ball past a defender before slotting it into Lynd’s near post. Notre Dame was still not finished, however. Gallagher, returning to the field from the bench, again found himself on the end of a pass and dribbled the ball around Lynd, but this time his shot from an angle could only hit the post. Sophomore forward Jeffrey Farina was perfectly placed for the rebound though and needed little more than to let the ball hit him to make the score 5-0 in the 68th minute. From there, the Irish remained in control, not creating many more serious chances, but giving Pittsburgh very little of the ball until the final whistle. With the win, Notre Dame clinched the No. 4 seed for the ACC tournament, meaning a home game against fifth-seeded No. 18 Virginia to open postseason play. The game will begin at 1 p.m. at Alumni Stadium on Sunday.